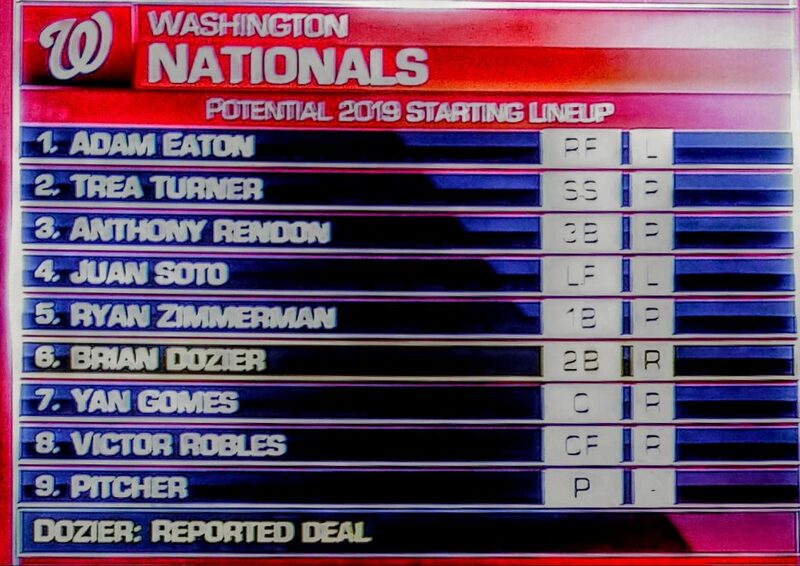 Your 2019 Washington Nationals team is almost complete! 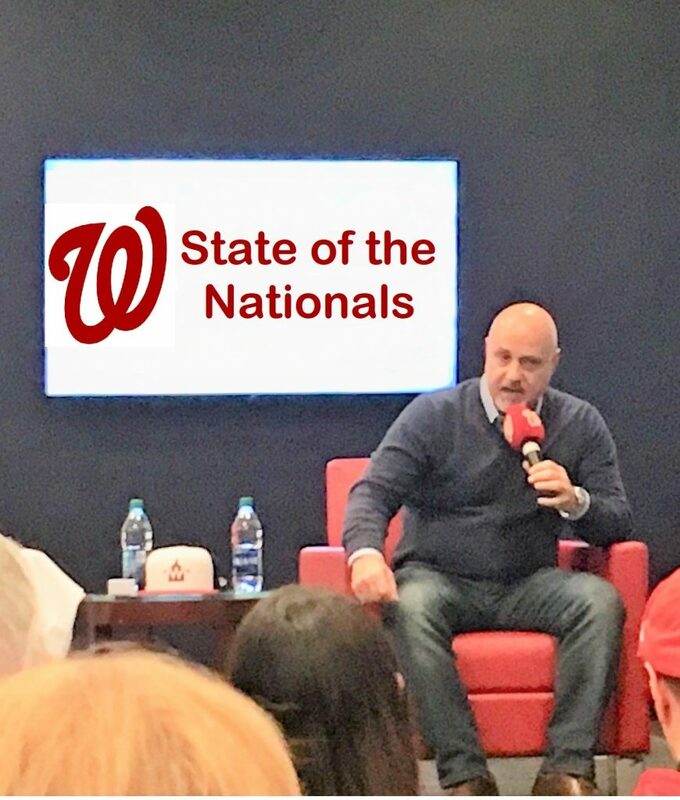 For the Washington Nationals general manager Mike Rizzo, the $199 million he spent in salaries this off-season to acquire Kyle Barraclough, Trevor Rosenthal, Kurt Suzuki, Yan Gomes, Patrick Corbin, Matt Adams, Anibal Sanchez and Brian Dozier has pushed his payroll to $195 million before incentives and bonuses. For all intents and purposes, the payroll is tapped out except for a few million dollars which puts the team near the $206 million CBT cap. If there is any good news, the Nationals could start the season with what they have and piece together the fifth starters spot in the rotation. Last year, Rizzo acquired Jeremy Hellickson on a minor league deal just like he has done for this season with Henderson Alvarez and could do with other starters. With the Dozier acquisition, he said the decision was about the right fit for him and for his wife. He also said that his knee has had sufficient time to heal from the bone bruise which hampered him during the 2018 season. So what does the team look like today? According to FanGraphs, the Nationals are a 92-70 team after the Dozier acquisition. That puts the Nationals 7-wins ahead of the Mets who they project at 85-77 for the 2019 season. FanGraphs has the Braves at 82-80 and the Phillies at 80-82. The unknown right now is what moves these teams will make going forward. If you believe everything that Bob Nightengale is tweeting out, the Phillies will get Bryce Harper, Dallas Keuchel and Craig Kimbrel. Well I guess we will see when all the smoke clears the room. Those are some bold statements, and they are stated as fact by the word “will” not the word “could” so this will be interesting to watch after Nightengale declared the Phillies would not be out-bid on Patrick Corbin, and we know how that turned out. Players make their own choices, and there is competition for these players. This is not shopping for a Ferrari 455 Spyder rather it is like shopping for a one-of-a-kind Ferrari that three or four discerning buyers covet. Only one will get it!